SAN LUIS OBISPO — The Cal Poly Dairy Judging Team took second place in the North American International Livestock Exposition Dairy Judging Contest in Louisville, Ky.
Seventeen teams representing the top dairy college programs from Wisconsin, Minnesota, Idaho, Indiana and California competed in the 43rd annual North American International Livestock Exposition Dairy Judging Contest, being held Nov. 1-17. Cal Poly was the highest-ranking team in judging Holstein breed dairy cattle and in “reasons,” in which students must explain in detail why they ranked the cows as they did. The team placed fourth in all other breed categories, and all four team members placed in the top 12 high individual rankings overall. Team members included sophomores Elise Regusci and Elisabeth Regusci, both from Modesto, and juniors Caitlin Lopes from Los Banos, and Alex Gambonini from Petaluma. 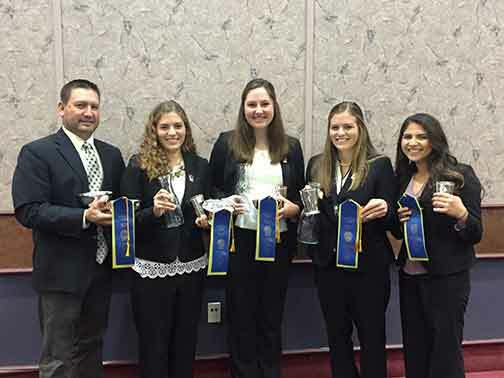 Cal Poly’s Dairy Cattle Judging Team is coached by dairy science Professor Rich Silacci. The 43nd annual North American International Livestock Exposition is the world’s largest all-breed, purebred livestock exposition, with 10 different species of livestock competing over the show’s 17-day run.